The hardtail to challenge full sus bikes on technical trails. 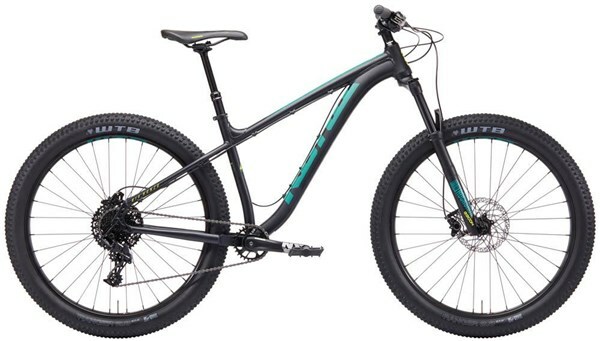 The Kona Big Honzo is a plus sized mountain bike that combines dialled trail geometry with a 130mm travel RockShox fork. With the extra grip and float offered by the plus sized tyres the Big Honzo is far more capable on challenging trails than the average hardtail. You love the Honzo but wanted an aggressive hardtail with a bit more versatility. Enter the Big Honzo. With geometry derived from our carbon Big Honzo’s, the Big Honzo was designed around a 27.5+ wheel but is cross-compatible with a 29” wheel, allowing you to create your favourite configuration to get the most out of the terrain you ride the most. The Big Honzo features 130mm of RockShox front suspension, boost spacing, a SRAM NX 1x11 speed drivetrain, a dropper post and hydraulic disc brakes in an affordable package. Kona 6061 Aluminium - Kona 7005 and 6061 Aluminium alloys are used extensively throughout our fleet of mountain and asphalt bicycles. A tough, durable, light alloy, both Kona 7005 and 6061 deliver fantastic, reliable performance that lasts for thousands of rides. Much of our 7005/6061 tubing is butted and/or formed, meaning the tubing’s wall thickness can be increased or decreased, as well as shaped, so we can fine-tune a particular frame’s strength and ride characteristics depending on its intended application. Tapered Headtube - More girth at the bottom of the head tube better distributes shock force, prolonging the bearing life of the headset itself and eliminating brake shudder, while providing confident steering performance. The inherent strength of its triangular design also means a stronger steering position and improved balance, giving the rider more control in rough terrain. A zero-stack, tapered head tube also puts strength where the load is going—into the lower headset cup—maximizing bearing durability where it’s needed. 12x148mm Axle - 12x142mm, 12x148 and 12x157 rear axle standards provide two major advantages to the Kona rider: the 12mm diameter of the rear axle provides the rear hub and frame with a stiff interface, while the 142/148/157mm outer diameter of the hub allows the wheel to be quickly and properly positioned in the frame before the rear axle is inserted. For 2017, you’ll see the 12x148 Boost standard in the mix. Boost spacing provides more tire clearance at the chainstay yoke, while the rear wheel is stiffer and more durable relative to a 12x142 thru-axle. 27.5"+ Wheels - The benefits of the 27.5-inch wheel are simple: they roll over obstacles and track better than 26-inch wheels, but are more manoeuvrable and nimble than 29-inch ones. Front Tyre: WTB Ranger TCS 27.5x2.8"
Rear Tyre: WTB Ranger TCS 27.5x2.8"